The first annual STEMZone, held on the lawn in front of the Miller Learning Center at UGA. Photo courtesy of The Red & Black newspaper. ECOGIG brought the Ocean Discovery Zone to the first ever STEMZone held on The University of Georgia's main campus in Athens, GA. The event was held in front of the Miller Learning Center, in the shadow of Sanford Stadium. 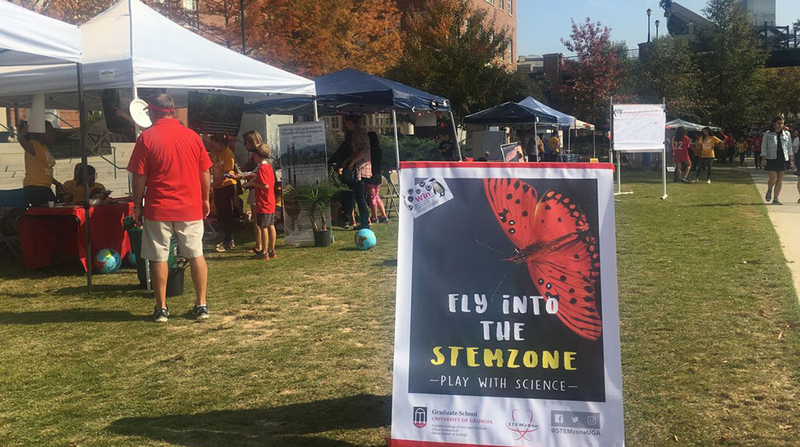 STEMzone is new graduate student led initiative focused on connecting UGA football fans to science. This interactive event allowed graduate students and science groups on campus to share their research and passion for science with a broader group of people. STEMZone included hands-on, all-ages, interactive booths hosted by graduate students from STEM-related (Science Technology Engineering and Math) academic units and organizations. In total there were 12 booths from groups around campus at the first annual STEMZone, and there was a fantastic visitor turnout. The interactive booths ranged from ECOGIG's Ocean Discovery Zone to butterflies to snakes to strawberries - there was a little bit of science for everyone!